You are here: Home » MEDIA » Books » Once Bitten edited by Steve Lewis (book review). 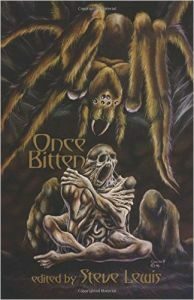 Once Bitten edited by Steve Lewis (book review). Too many authors have been asked, by non-writers, where their inspiration comes from. There is never just one answer. It can be from anything: a piece of music, an overheard conversation, a newspaper report. Many will tell you that writing is about hard work rather than inspiration but, the initial spark, the starting point has to come from somewhere. In the case of this volume, the starting point was the artwork. Theresa Derwin, the instigator of ‘Once Bitten’, saw the painting by Stephen Cooney and thought it would make the ideal cover for a horror anthology. The fifteen stories that finally ended up between the covers all have theme of love or obsession. There is a very fine line between the two and there is always a problem when the object of desire doesn’t return the affection. The two stories that are most memorable in this volume are ‘Housebound’ by Jacob Prytherch and ‘Mama’s Boy’ by Steven Chapman. In the first, Tom Harper is the object of desire and she is very jealous. He cannot leave his house. All his groceries are ordered online. It is the house itself which loves him, and will kill intruders to keep him. The second has similarities. In this case it is Roger, a postman, who is the prisoner, but he is being kept in the basement by a woman who treats him as though he were her baby. In some stories, the obsession doesn’t always become apparent until the end as in ‘Paper Frog’ by Martin Nike. A meeting on the train between Donald and Suzy develops nicely, especially as he realises that she can read minds. The other significant characters are well drawn but the end of this particular story is disappointingly rushed and confused. The brief for these stories didn’t confine the writer to contemporary horror and SF and fantasy scenarios have been exploited. ‘To The End Of Love’ by Elle Joyce is a future setting where civilisation has suddenly broken down. There is no explanation but none is needed. In fleeing from an exploitative man, Gina falls, literally, into a safe house. Marax is willing to keep her safe in exchange for experiences he cannot otherwise have via the use of a drug. Here, both the drug and love are addictive. It is a well-executed piece of writing. ‘Love Bites’ by Nic Martin is also set in a civilisation which is disintegrating. When Tom is bitten on the way home from shopping, he becomes ill and Deb loves him too much to carry out the necessary mercy stroke the media tells her she ought. These stories, despite similarities, have strengths in different areas and are good counterpoints to each other. ‘Oblivion Is The Sweetest Word’ by John R Fultz is the only story that actually uses the cover image as the focus. It is a fantasy in which Taizo the thief is promised great riches to acquire the venom of the sacred spiders of Ghoth. He falls in love with one of the local girls, a love that is doomed by tradition and by what he later discovers. Not only does it match the cover but it is also well crafted. Myth is always a good source for stories. Unfortunately, too many are just retellings without adding anything to the myth. No so in the case of ‘Thrill Of The Chase’ by N.O.A.Rawle. It starts shakily but gains strength as the narrator gains confidence. It works on the premise that there are monsters living amongst us, in this case, a lamia. She wants to fit in to human society but her true nature is always likely to surface. The eight other stories all have something that gives them a touch of originality. Not all of them are brilliantly executed. They may start heavily and improve towards the end or do not have clear enough endings. Ambiguity is fine in a story, so is surrealism but confusion lets it down. All stories have a horrific or macabre element to them and if you enjoy that kind of story, there will be something here to like. « Television’s Female Spies And Crimefighters by Karen A. Romanko (book review).